Back in the nineties, we wrote to Tony, introducing our organisation, he replied expressing his full support and solidarity to the people of Cyprus in their struggle against the continued occupation of Northern Cyprus by the Turkish army. In other correspondence, Tony Benn reiterated his support for our struggle, and was a regular speaker at the Cypriot annual protest in London for many years, where he called for Turkey to be thrown out of NATO until all its troops left the island. Tony was a champion for the weak and the oppressed, and we, the Greek People have lost a friend and a great supporter of our cause. He will be sorely missed by everybody who saw him as a genuinely good human being, with the courage of his convictions and a moral compass second to none. Someone who believed in his truth till the very end. 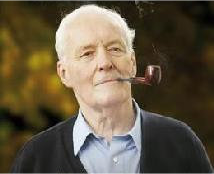 Veteran Labour party politician Tony Benn, who as Anthony Wedgewood Benn was born to an aristocratic family, but as a man of the people – “Tony Benn”, died today aged 88. His four children in a statement to the BBC, said their father had died peacefully early on Friday, at his home in west London surrounded by his family. He had been taken ill, in early February and was thought to be staying in hospital for a few days. .
Tony Benn was a member of parliament for 50 years and a cabinet minister for 11 years under two prime ministers, Harold Wilson and James Callaghan. He was a real politician, not one to pull punches. Yes he was termed a leftie a commie “the most dangerous man in Britain”, but those epithets were used by the people who didn’t like his way of helping the less fortunate than himself, and who didn’t have his eloquence in speaking and his empathy with the very people they were elected to serve. He backed the Miners strike, opposed joining the Common Market , was against our involvement in Iraq and Afghanistan, and was vocal in his denunciation of the American, British and Turkish involvement in Cyprus. In 2006, he came top in a BBC poll to find who people considered to be their political hero – he beat Margaret Thatcher into second place. It seems the people as they grew older get wiser, but it was too late to elect a labour leader who was a real socialist. As a “left-wing politician with fire-brand views” , he was often attacked – verbally – by his opponents. He shrugged of all the ad hominem attacks, responding that politics should be about policies and not personalities, and stating in a 1994 newspaper interview …. It seemed to me when growing up, the Media portrayed Tony as a lone voice against reason, and yet those without bias could see he was always championing the cause of whoever or wherever injustice was seen to be done. In 2007, he wrote: “I feel totally out of sympathy with the Labour Party on civil liberties, on the war, on Europe, and perhaps the only answer is to die, which is an extreme thing to say, but I don’t know how I’m going to cope.” I suppose the lies and hypocrisy killed him in the end. “There is no moral difference between a stealth bomber and a suicide bomber. Both kill innocent people for political reasons. Next: What Jim knew and Henry did ..